Subscribe on iTunes, Google Play, or by RSS for more space exploration discussions. Cover image: Nexø I, launched on July 23rd 2016, was the first liquid bipropellant rocket launched by Copenhagen Suborbitals. The amateur space program's Nexø class rockets are technology demonstrators for systems that will eventually be used to launch a human on a suborbital flight past the Karman line. Credit: Copenhagen Suborbitals Flickr. This week on SPEXcast, we sit down with Mads Wilson, Communications Lead for Copenhagen Suborbitals, a volunteer space program based in Denmark with the ambitious goal of launching a human into orbit. We delve into the history of CopSub with Mads, reflecting on the engineering process for their past and future rockets, and the unique challenges and benefits of volunteering engineering blood, sweat and tears into a space program open to (almost) all. Copenhagen Suborbitals is an all-volunteer, crowd-funded space program whose ultimate goal is to send a human past the Karman line, or 100km above sea level--the accepted boundary between Earth's atmosphere and outer space. CopSub was founded in Denmark back in 2011. 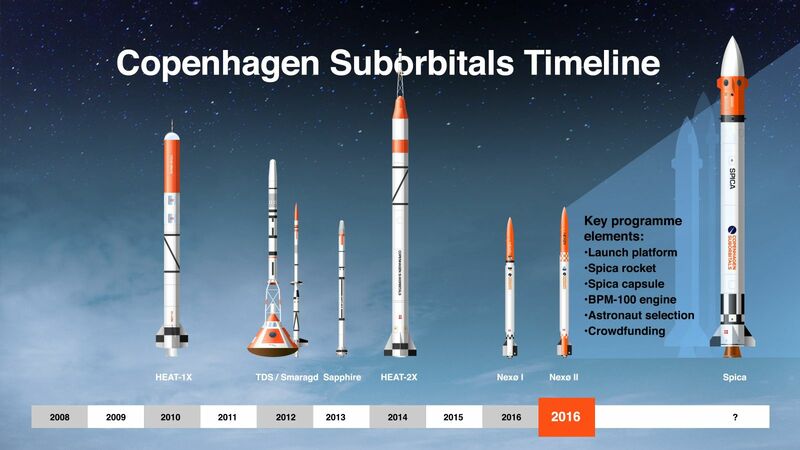 Since then, the group has launched five scratch-built suborbital rockets from a ship in the Baltic Sea and aims to launch their latest vehicle, Nexø II, later this year. Testing and final preparations are underway for Nexø II to take flight later this year. Image credit CopSub Flickr. Nexø II is the second technology demonstration vehicle used to flight-test the designs and hardware that will eventually evolve into CopSub's Spica class rocket. 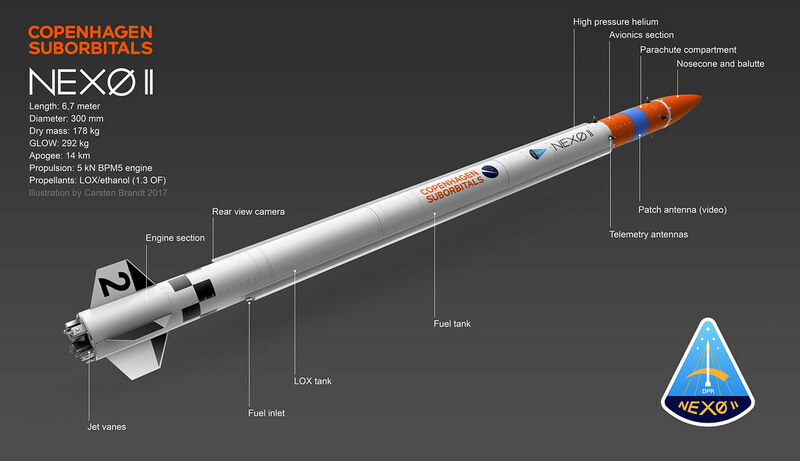 While Spica will include a capsule for a human passenger, Nexø is a smaller class of rocket that has all the same core technologies. From CopSub's information page, "The Nexø II rocket is powered by our own BPM5 engine providing a nominal thrust of 5000N running on ethanol and liquid oxygen. It has a body diameter of 300 mm, a total length of 6.7 m and a dry weight of about 178 kg. With a target filling ratio of 85% propellants it will carry 114 kg propellants for a Gross Lift-Off Weight (GLOW) of 292 kg." The information page features a trove of engineering goodness, including videos and technical descriptions of the hardware designs. Did I mention these guys are doing this in their free time? To stay up to date with CopSub's rocket development and see real test data, be sure to visit the Copenhagen Suborbitals blog. Here's a playlist of technical Nexø II videos from the official CopSub Youtube channel. To learn more about Copenhagen Suborbitals and their rocket designs, we spoke with CopSub's Communications Lead, Mads Wilson. SPEXcast: What is your background and what do you do with Copenhagen Suborbitals? Mads Wilson: My name is Mads Wilson and I have a degree in Physics and Computer Science and in my "civilian life," if you can say that, I'm working as an IT consultant. I have been in the advertising business for many years in the technical side of advertising. I finished my degree after 2000, and as you might know, a lot of us who could do any kind of programming were sucked in to businesses after that, because everyone was screaming after people who could program. So that's where I ended up. And then along the way, I heard of this project locally, not very far from where I work and live, where these guys were trying to be the first amateurs in the world to build a rocket to put a man at space. And I have always been fascinated with space. I had also been tinkering with electronics at home, and I was very eager to find a project where the stuff that I was playing with at home actually could be used for something. I simply... one day I took my car, I drove out there and said, "Hey, is there something I can do to help?" and they have been stuck with me ever since. Wilson: Around 60... It depends on how you calculate it. We have a lot of team members that are not there every day that we just use on occasion. So I would say on a day to day basis, we are about 25 to 30 people. Copenhagen Suborbitals is trying to launch a human past the Karman line. Can you tell us a bit about the Spica rocket that you are developing? Wilson: Yes and no... it's still work in progress. Contrary to others, a lot of the stuff we do is designing as we go along. Of course, we have the overall layout and we know how the rocket will be in general terms, but for much of the things that we're building we are deciding things as we go along. It will be between 15 and 17 meters tall, one meter in diameter, and it will feature 100-120kN main engine, gimbal controlled and propelled by liquid oxygen and alcohol--ethanol. It'll be controlled by the same guidance system and a computer system as we use on the Nexø rockets. Really, the two Nexø rockets--One we flew in 2016 and the one we will be flying this year--are technology demonstrators for the Spica rocket. We have built the entire computer system and all the communication systems in such a way that they can be used directly on the next rocket, which is one of the reasons why we're building the small Nexø rockets All of the technology apart from the engine itself will be the same. Where could our listeners go to learn about the technical specifications for your rocket and systems? Wilson: We publish as much as we can on the website. Unfortunately, rockets and rocket components is something that is very highly regulated. So even though we would like to have this be a total open source project, there are lot of things that we cannot show. We can own show the science to a certain degree. So the best place to look is to look at our Youtube videos. We do a lot of walkthroughs there, you can see how different items are built, but we cannot publish the source code or blueprints or anything. What's the subsystem that's currently under the most development or most exciting development right now? Wilson: In the most exciting development phase right now... I would say that right now as of today, it is probably the new computer system that we're working on, the new guidance system. But in terms of complexity right now, I would say it's actually our video streaming software--that is open source, and you can find that on SourceForge--it's called is Snowmix. And that is a completely custom built-from-scratch distributed video mixing service. What we do is we have cameras on our platform, 30 kilometers out at sea and all those cameras, and all the mixing and everything is controlled in a old camper that is placed outside our workshop in Copenhagen remotely. And it's our one of our engineers, Peter, who has written that software from scratch. That is open source and you can download it for free. That is actually one area where people can contribute because it's just video processing. Check out the code! : You can download Snowmix for free through SourceForge or visit the Snowmix Support Forum to get involved and contribute. Community members do have plugins/extensions to Snowmix that are on GitHub, and there are other open source repositories of CopSub software like the telemetry system for the Sapphire test flight. Your team is an all volunteer space program. Traditionally, space exploration has been the realm of government agencies. Recently, we've seen private commercial companies making strides in space, but Copenhagen Suborbitals has an even more unique approach. Do you think these kinds of community driven engineering projects will become more popular, whether in space industry or even other industries or other projects? Wilson: I hope so! We have seen it with the software community. Just look at the Unix platform and there are so many other platforms. The Arduino framework is also a good example of community driven development and design. So I hope so. One thing regarding space flight I see as an issue or something that we also experience as issue is that it is very difficult for us to work across borders. One thing is because doing hardware stuff...well, we need people to be at the site to do the work. But also because building rockets is something that is very, very heavily regulated. Especially in the US but everywhere in the world. So working with rocket technology across borders is just something that you cannot really do. We can't have a software engineer sitting in the US designing a guidance system that we will be using to launch a rocket in Europe. It's simply not possible, or at least not without even more paperwork. In terms of what we're doing that is a major obstacle for distributing or doing community work. But in other areas, I really, really hope that this is something that would just explode and become very big because there's so much more you can do when you find like minded people all over the world. And there's so many more like minded people if you're not just looking in your own backyard, but you're able to look all over the world. CopSub is entirely volunteer driven and donation supported. If you'd like to support the work Mads and others are doing, check out their donation page.. Supporters get access to blogs, videos, and live-streamed launch events, so you can follow their journey. Check out these videos featuring Mads Wilson discussing the various systems that go into CopSub's rockets.